Don't worry, I won't reveal any spoilers for those who for some odd reason unbeknownst to me haven't seen the movie yet. You know that feeling you get when you're reading the Twilight books that stays with you for several days after that makes you feel all warm and fuzzy and hopeful and you never think it will go away and all you want to do is walk around like a zombie muttering, "Twilight. Twilight. Twilight."?? That's how I feel right about now. My head is in the clouds. Or maybe I feel the way I do because I only got 3.5 hours of sleep....Either way, NEW MOON WAS FREAKING AWESOME!!! I got off work at 5:30 and rushed home to eat dinner and put the animals to sleep. Then we picked up Blake and Veronica (Erica and Brian, the spouses of the aforementioned, were coming a little later) and headed to the Santa Anita AMC theater. We got there around 7:30pm for the 9pm showing of Twilight. What baffles me is that people were already lined up for their various midnight showings of New Moon. Why sit outside in the cold when you could be inside all warm and toasty watching Twilight? Plus, since we stayed in the same theater after Twilight to watch New Moon, we got the best seats in the house; everybody waiting outside had to fill in the leftover seats. Anyways, I'm just trying to say that I'm super glad we signed up for the double-feature. Blake = our very own vampire; see the red in his eyes from drinking too much human blood? Or something... (3.5 hours of sleep people, my jokes aren't quite up to par on this fine morning...) Here's me with my fellow Twilight lovin' home girls Veronica, Jenny, and Erica. (Thanks for the shirt Marlene!) These are the husbands we had to drag tooth and nail to get to come with us. Haha. False. They actually volunteered. Guys like Twilight, too! -> not only a statement of fact, it's a Facebook group Chris has joined. What a catch :) This is the theater we shared our New Moon experience with. Excellent crowd participation. Always makes things more entertaining. Intermission = potty break and audible gasps at the length of the concession lines. A few others showed up for New Moon like Brian (of Brian and Veronica), Kate and Pehrson, and Kim and Alyssa. The more the merrier! What I especially loved about watching Twilight before New Moon is it totally put me in the "Twilight" mood. New Moon picked up right where Twilight left off. Alls I'm gonna say about the movie is, I almost converted to the dark side. Meaning, I almost converted to Team Jacob. That Taylor Lautner is a dang good actor (those pecs don't hurt to look at either :) Plus Kristen Stewart's acting was improved 100 fold. Overall, I'm in la la land and don't fancy coming back down to earth anytime soon. 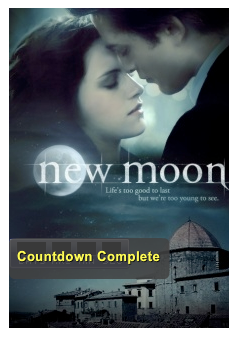 I'm off to find an Eclipse countdown widget to replace the New Moon one! Can't wait 'til June 30th- only 222 days away! I thought the movie was awesome! peggy! i saw it lasy night and i am SO with you! it was amazing, k-stew was so good, and jacob was the offical scene stealer!! im going again tonight and i cant wait! the music was amazing too...LOVE IT! im off to write my blog about it too! We thought it was great too, and we were definitely glad we caught the double feature too!!! OH YAY!! Thanks for the Post Paige! I am going tomorrow! Roger is actually really excited too! That makes me even more excited....plus I AM A JACOB FAN!!!!! LOL Don't hate me! :) Love ya! And no I am not a Jacob fan only because he has pecks ha ha! Ok so I loved the movie... but I had THE MOST annoying people sitting behind me. TALKING EXTREMELY loud the WHOLE time! i could've killed them. They had never read the books. Had no respect for anyone. just RUDE! It was terrible. But the movie was wonderful. I can't wait to see it! I haven't seen it yet! Shocker! I saw it! I loved it! So good. Look for my full review soon. So good! i agree with your review 100%. i, too, was totally tempted to join team werewolf. when you find that eclipse widget, pass it on! June 30th is going to come up SO quickly! YAY!